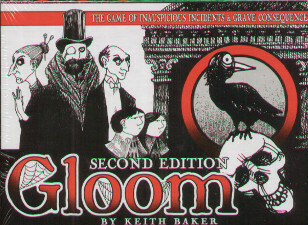 In Gloom your goal is sad, but simple: Make your freakish family suffer the greatest tragedies possible before passing on to the well-deserved respite of death, and tell tale of their miserable demise. Play cards with horrible mishaps on your own Characters to lower their Self-Worth scores, while cheering your opponents with happy occasions that pile on positive points. Clear plastic cards reveal, or cover up the effects of the cards below. The totals showing through give your score. May the most miserable soul win! Rules cards and icon reminder cards are included for easy reference.